Pioneering arts training is a UK first | News by Wales Express News, People Before Profit! 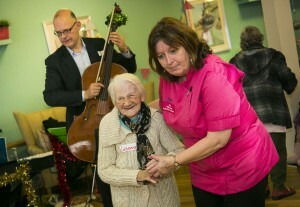 A care organisation has developed a pioneering training course thanks to a musical collaboration with one of the world’s top orchestras. All members of staff at Pendine Park in Wrexham are being trained to use the arts as a way of improving the quality of life for the residents of their seven care homes. The partnership with the Hallé was facilitated by Arts and Business Cymru, who bring the worlds of arts and business together. Pendine Park’s Artist in Residence, Sarah Edwards, is passionate about the value of the work with the Hallé and the new qualification which is the first of its kind in the UK. The arts will also play a big role at the organisation’s new £7 million centre of excellence for dementia care that’s being built on the site of the former Bryn Seiont community hospital on the outskirts of Caernarfon. The aim is to trial it as an in-house course for staff with a view to developing it into a nationally recognised qualification that could be rolled out across Wales. Sarah said: “We were absolutely blown away to have the opportunity to work with the Hallé and we really wanted to build on that and embed music and the arts into the lives of all the patients and staff at Pendine Park. “Music can bring out a range of emotions in people – laughter, tears, happiness, joy. “It takes people’s mind off their everyday problems. For that moment in time they’re free to express themselves, to enjoy themselves, and to just have a good time – it’s priceless. “We’re training the staff as part of our Enrichment Programme to deliver their own versions of music workshops. “They bring a lot of laughter and fun to the proceedings and they get the residents up and singing which is just what we want really. “It’s a core aspect of training and the arts play a vital part in our Enrichment Programme and music is one of the main focuses. “It will be part of the pre-diploma training and there’ll be toolkits for each aspect of the arts and they will help to embed the arts in the training of the staff so that they can deliver a version of it themselves. They can buy into it and the good that it does to our residents and our staff. “Our approach is unique and is attracting a great deal of interest from across the UK. “We have developed the Enrichment Programme in arts awareness in conjunction with our in-house training arm, Smartcare Training. “It is made up of several modules, including music and the arts. We also work on visual art and colour therapy, laughter therapy and creative writing as well. “Research has shown that the benefits of facilitating creativity and allowing people to express themselves has a very positive impact in terms of leading fulfilled lives. John Summers, the chief executive of the Hallé, was impressed with what he saw and heard during his first visit to Pendine Park. He said: “I think the most amazing thing I have seen is the way that the staff now gets involved so readily in the process. “They dance, they partner, they play the instruments and they just provide that leadership and confidence for the folk to have a go. The atmosphere here is absolutely brilliant. “When the music starts, their faces just explode with joy and they all want to take part and have a little go. Mr Summers paid tribute to the commitment to the arts of Pendine Park proprietors, Mario and Gill Kreft. Mr Kreft said: “The arts gives people a sense of purpose and our collaborations with the Hallé and Welsh National Opera have certainly helped residents to lead fulfilled lives. “Very often, people have not realised that they have an artistic talent – so it gives them an enormous sense of achievement and pleasure. “They look forward to the lessons and the gallery visits and the exhibitions that we put on here.